One of my favorite lessons, that will always stay with me, was being taught the importance of your work really meaning something to you, putting heart and soul into everything that you do and most importantly, to think differently. Its interesting how one simple thing can change the way that you work and can stay with you for the rest of your career. This one particular event was so, so simple, yet brilliant, original and creative! At the time I was studying A level art at South Bristol college (UK) and it was our very first lesson of the year. Our lecturer, who I remember resembling the late celebrity artist and television presenter Tony Hart had asked us to start the year by bringing in our very favorite piece of work. One by one, those who had remembered, worked through our slew of portrait, landscape and activist commentaries on society. Each one of us had valued our selection of work solely on the technical aesthetic of what we had achieved. Our lecturer gracefully commented on each piece, offering his vast experience. What I remember liking so much about this particular lecturer was that he would never expect you to do something that he wouldn't do himself and after we had gone through all our paintings and drawings he was also going to show us the piece of work that he had done, that was his favorite. We all waited excitingly to see what he had brought in, after his many years as a successful artist/illustrator each one of us students were expecting to have our socks well and truly blown off. Throughout our lesson, his piece of work had sat behind his desk, ready for the big reveal. It had been facing away from the class and it was large enough that it stood a good foot above his desk. He always sat on his desk, never behind it. I loved that as it really made a statement to me! He was free thinking and not stuck up like some of the other lecturers. When all us students had finished showing our best pieces, my lecturer jumps from his desk, walks around and excitedly picks up his piece of work. He looks across the class and with a smile on his face, slowly starts to turn his work around for us all to see. Completely bemused, all of us students looked around at each other in confusion! Some laughed wondering if he had made some form of mistake. For all intents and purposes, it looked as if our lecturer had brought in his pin board from home. It was thick with pictures, notes, receipts and little drawings. Was this some form of joke or mistake! When the noise from the class began to lower, the lecturer started to speak softly. He first confirmed that this was both his favorite piece of work and that it was also his family pin board. He told us that it represented the things that he valued the most in his life. It was his family and friends in a visual form. His daughters first painting. Hand and foot prints. Photos of his children, one was the day that his son had walked for the first time. There were also photos and receipts from activity's and day trips out together. There were letters from distant family and friends and somehow the whole thing just looked beautiful. He told us that the best art and design comes from emotion, experience and observation... From life. Sometimes the answer can be staring us in the face and we don't even see it. As artists and designers, we need to see the world differently. It wasn't a painting or a drawing, but this pin board was his art. His art was his life! With great art and design you have to be able to see the hidden beauty that's all around us and then be able to translate that to your audience. And the fact that it's a commercial job is still no excuse. You need to maintain integrity in everything that you do. For instance, there are some organisations and companies that I just wont work for. That pin board often comes back to me. It taught me an incredibly importance lesson about taking initiative and not always doing what you believe is expected of you. As a designer you should be looking for that simple clear meaningful answer in everything that you do. Work through all the rhetoric to find that hidden simple truth. You need to find your pin board in everything that you do! This story dates back to the late 1980's. 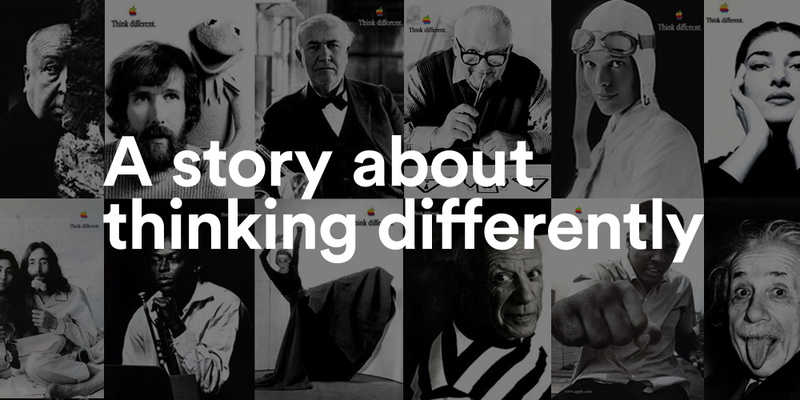 Just over ten years later, after Steve Jobs return to Apple, the company released their 'Think Different' campaign. This legendary piece of marketing was accompanied on the TV ads by the now famous 'Crazy Ones' speech, which played a significant role in the re emergence of the business. When I see past images from that campaign or hear that speech, I often think of my lecturer and his lesson. Ive added the full text of the brilliant 'Crazy Ones' speech below.